The junior market dropped sharply on Wednesday, by 59.20 points close at 2,426.18 to be up 35 percent for the year to date with reduced volume from Tuesday’s levels. At the close the prices of 2 stocks rose and 5 declined with 13 securities trading, compared to 14 on Tuesday. The volume of stocks traded dipped on Wednesday by 27 percent, from Tuesday’s level, ending with 262,692 units changing hands, valued at $1,233,984, down 30 percent from $1,755,268 on Tuesday. 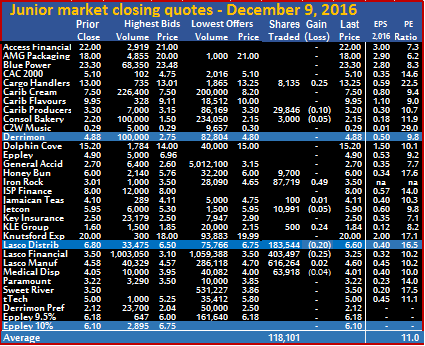 Market activities ended with 11 securities closing with bids higher than their last selling prices and just 5 ending with lower offers. An average of 20,207 units with an average value of $94,922 traded, compared to 25,837 units with an average value of $125,376 on the preceding trading day. The average for December to date is 104,241 units, at an average of $478,446. The average for December to Tuesday is 113,578 units, at an average of $521,060. November ended with an average of 109,679 units with an average value of $607,092. In trading activity, Cargo Handlers traded 17,225 shares and fell 24 cents to close at $13.01, Caribbean Cream jumped 45 cents to $7.95 with 3,000 shares being exchanged, Caribbean Producers shed 5 cents with 20,000 shares changing hands at $3.20, Derrimon Trading exchanged 1,000 shares and closed at $3.70 after dropping $1.18. Dolphin Cove fell 20 cents with 1,784 units changing hands to close at $15, Honey Bun had 48,040 shares changing hands to close at $5.60. Jetcon Corporation closed trading with 200 units to end at $5.89, Key Insurance traded 13,157 units to close with a rise of 50 cents at $3, Lasco Distributors had 4,200 shares trading with a loss of 30 cents to close at $6.50. 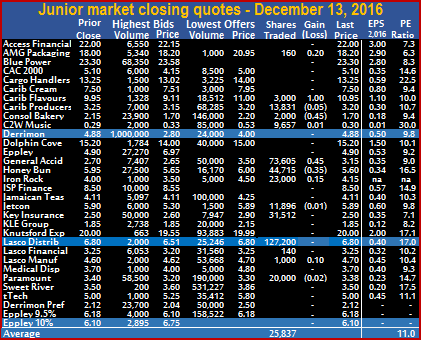 Lasco Financial ended with 31,270 shares changing hands at $3.25, Lasco Manufacturing ended at $4.70 with 30,929 shares changing hands, Paramount Trading lost 18 cents with 87,937 units changing hands to close at $3.20 and Eppley 9.5% preference share traded 3,950 units at $6.18. 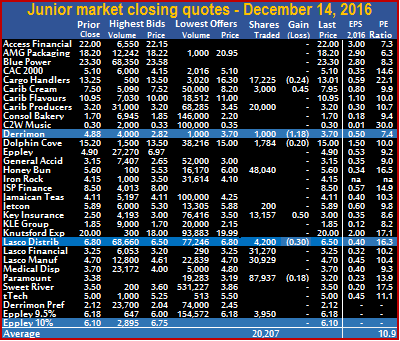 The junior market made strong gains at the close of trading on Tuesday, to sit 10 points away from the record close of 2,495.22 on November 14. At the close, the market index rose 36.01 points to end at 2,485.38 with reduced volume from Monday’s levels. 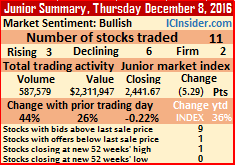 With today’s movement of the index, the junior market is up 39 percent for the year to date. At the close the prices of 6 stocks rose and 5 declined with 14 securities trading, compared to 12 on Monday. The volume of stocks traded dipped on Tuesday by 65 percent, from Monday’s level, ending with 361,716 units changing hands, valued at $1,755,268, down 67 percent from $5,305,996 on Monday. Market activities ended with 12 securities closing with bids higher than their last selling prices and just 5 ending with lower offers. An average of 25,837 units with an average value of $125,376 traded, compared to 102,106 units with an average value of $530,600 on the preceding trading day. The average for December to date is 113,578 units, at an average of $521,060. The average for December to Monday is 124,545 units, at an average of $570,520. November ended with an average of 109,679 units with an average value of $607,092. In trading activity, AMG Packaging traded 160 shares and gained 20 cents to close at $18.20, Caribbean Flavours jumped $1 to a 52 weeks high of $10.95 with 3,000 shares exchanged, Caribbean Producers shed 5 cents with 13,831 shares changing hands at $3.20, Consolidated Bakeries traded 2,000 shares and closed at $1.70 after dropping 45 cents. C2W Music inched up 1 cent with 9,657 units changing hands to close at 30 cents, General Accident gained 45 cents and closed trading with 73,605 units, at a 52 weeks’ high of $3.15, Honey Bun had 44,715 shares changing hands to close with a loss of 35 cents at $5.60. 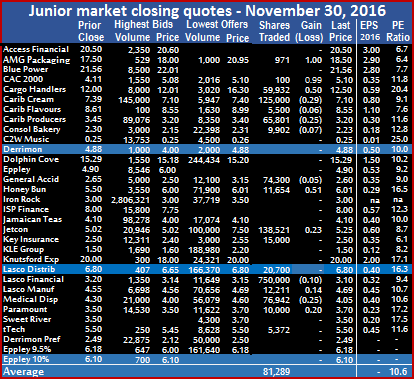 Iron Rock Insurance traded 23,000 units as the price rose 15 cents to $4.15, Jetcon Corporation closed trading with 11,896 units but lost 1 cents to end at $5.89, Key Insurance traded 31,512 units to close at $2.50, Lasco Distributors had 127,200 shares at $6.80. Lasco Manufacturing gained 10 cents and ended at $4.70 with 1,000 shares changing hands and Paramount Trading lost 2 cents with 20,000 units changing hands to close at $3.38. New high for Cargo Handlers on Friday. The junior market held on to a small gain at the close of trading on Friday, as it pulled back from a much stronger rally in the morning session. At the close, the market index rose 6.87 points to end at 2,448.54 with increased volume over Thursday’s levels. 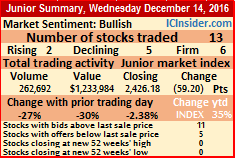 With today’s movement of the index, the junior market is up 37 percent for the year to date and appears to be poised to trade higher based on the number of bids closing above the last traded prices versus those that have offers lower than the last sale prices. At the close the prices of 5 stocks rose and 6 declined with 12 securities trading, compared to 11 on Thursday. The volume of stocks traded climbed on Friday by 141 percent, from Thursday’s level, ending with 1,417,214 units changing hands, valued at $6,281,632, up 172 percent from $2,311,947 on Thursday. Market activities ended with 7 securities closing with bids higher than their last selling prices and just 4 ending with lower offers. An average of 118,101 units with an average value of $523,469 traded, compared to 53,416 units with an average value of $210,177 on the preceding day. The average for December to date is 127,751 units at an average of $576,223. The average for December to Thursday is 129,359 units at an average of $585,015. November ended with an average of 109,679 units with an average value of $607,092. The stock split into 150 stock units for Eppley ordinary stock is yet to attract any offers even after the bid had risen to $6.96, compared to the adjusted last traded price of $4.90. In trading activity, Cargo Handlers rose 25 cents and closed with 8,155 at a new closing high of $13.25 as the price pulled back from $15 it was at, for almost the entire trading session until the end. Caribbean Producers fell 10 cents with 29,846 shares changing hands at $3.20, Consolidated Bakeries had 3,000 units changing hands with a loss of 5 cents, to end at $2.15. 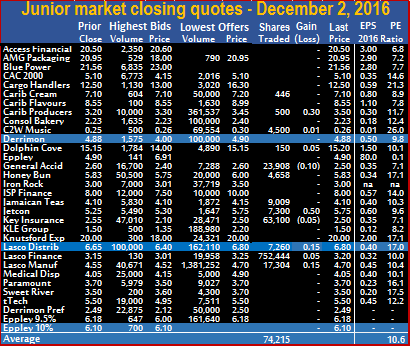 Honey Bun had 9,700 shares changing hands to close at $6, Iron Rock Insurance traded 87,719 units as the price jumped 49 cents to $3.50, Jamaican Teas traded 100 shares to close at $4.11 after rising by 1 cent, Jetcon Corporation lost 5 cents in trading 10,991 shares to close at $5.90. KLE Group gained 24 cents in trading 500 units at $1.84, Lasco Distributors had 183,544 shares changing hands to close with a loss of 0 cents at $6.60, Lasco Financial Services traded 403,497 units and declined by 25 cents to $3.25. At the close, there was a bid to buy 1,003,050 units Lasco Financial at $3.10 and an offer to sell 1,059,388 units at $3.50. Lasco Manufacturing gained just 2 cents and ended at $4.60 with 616,264 shares changing hands and Medical Disposables fell 4 cents while 63,918 shares traded, to close at $4.01. 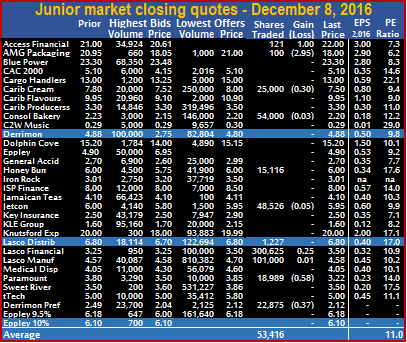 The junior market enjoyed low trading volume and lost ground moderately at the close of trading on Thursday. The market index slipped 5.29 points to end at 2,441.67 with increased volume over Wednesday’s levels. 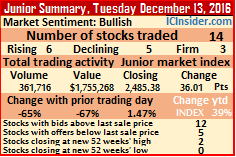 With today’s movement of the index, the junior market is up 36 percent for the year to date. At the close the prices of 3 stocks rose and 6 declined with 11 securities trading, compared to 15 on Wednesday. The volume of stocks traded climbed on Thursday by 44 percent, from Wednesday’s level, ending with 587,579 units changing hands, valued at $2,311,947, up 26 percent from $1,834,253 on Wednesday. Market activities ended with 8 securities closing with bids higher than their last selling prices and just 4 ending with lower offers. An average of 53,416 units with an average value of $210,177 traded, compared to 27,190 units with an average value of $122,284 on the preceding day. The average for December to date is 129,359 units at an average of $585,015. The average for December to Wednesday is 144,548 units at an average of $659,983. November ended with an average of 109,679 units with an average value of $607,092. The stock split into 150 stock units for Eppley ordinary stock is yet to attract any offers even after the bid had risen to $6.95, compared to the adjusted last traded price of $4.90. In trading activity, Access Financial Services gained $1 in trading 121 units, to close at an all-time high of $22, AMG Packaging lost $2.95 with only 100 units trading at $18, Caribbean Cream fell 30 cents with 25,000 shares changing hands at $7.50, Consolidated Bakeries had 54,000 units changing hands with a loss of 3 cents to end at $2.20. 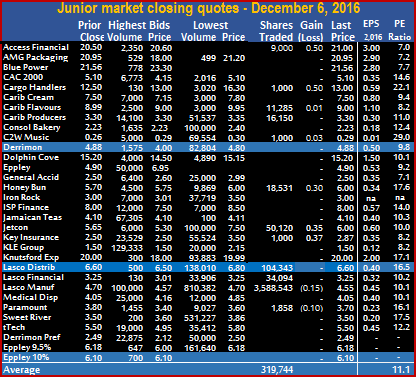 Honey Bun had 15,116 shares changing hands to close at $6, Jetcon Corporation lost 5 cents in trading 48,526 shares to close at $5.95, Lasco Distributors had just 1,227 shares changing hands to close at $6.80. Lasco Financial Services traded 300,625 units and rose by 25 cents to $3.50, Lasco Manufacturing gained just 1 cent and ended at $4.58 with 101,000 shares changing hands, Paramount Trading fell 58 cents while 18,989 shares traded, to close at $3.22 and Derrimon Trading preference share lost 37 cents, ending with 22,875 units changing hands to close at $2.12. 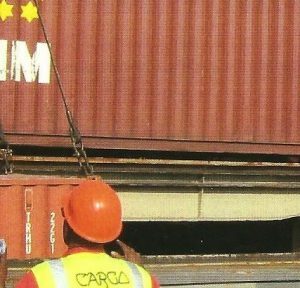 New high for Cargo Handlers on Tuesday. The junior market made more gains at the close of trading on Tuesday resulting in the market index gaining 21.14 points to end at 2,454.80 and is up 37 percent for the year. At the close the prices of 7 stocks rose and 2 declined with 12 securities trading, compared to 13 on Monday. Stocks traded, rose on Tuesday by 298 percent, from Monday’s level, ending with 3,836,924 units changing hands, valued at $18,753,528, up 304 percent from $4,640,109 on Monday. An average of 319,744 units with an average value of $1,562,794 traded, compared to 74,236 units with an average value of $356,931 on the preceding day. The average for December to date is 173,888 units at an average of $794,408. The average December to Monday is 125,269 units at an average of $538,279. The average for November is 109,679 units with an average value of $607,092. In trading activity, Access Financial Services traded 9,000 and close with a gain of 50 cents at $21, Cargo Handlers rose by 50 cents with 1,000 units trading at a 52 weeks’ high of $13, Caribbean Flavours traded 11,285 units to end at $9 with a gain of 1 cent. 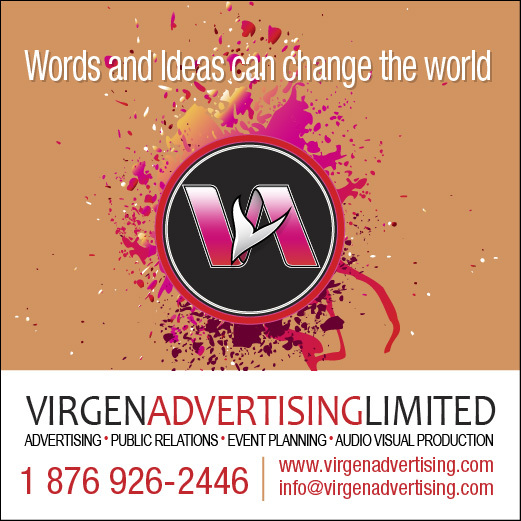 Caribbean Producers had 16,150 units changing hands to end at $3.30, C2W Music rose 3 cents with 1,000 shares changing hands at 29 cents, Honey Bun had 18,531 shares changing hands to close with a gain of 30 cents at $6, Jetcon Corporation gained 35 cents, to close at a 52 weeks’ high of $6, with 50,100 shares. 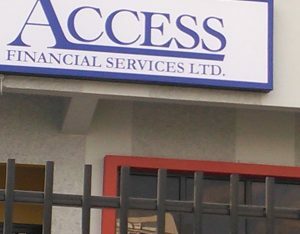 Key Insurance rose 37 cents in trading 1,000 units to close at $2.87, Lasco Distributors had 104,343 shares changing hands at $6.60, Lasco Financial ended with 34,094 shares being exchanged at $3.25. Lasco Manufacturing lost 15 cents and ended at $4.55 with 3,588,543 shares changing hands and Paramount Trading lost 10 cents while 1,858 shares traded to close at $3.70. The junior market index inched up by the end of trading on Monday resulting in the market index gaining 9.79 points to end at 2,433.66. At the close the prices of 4 stocks rose and 4 declined with 13 securities trading, compared to 12 on Friday. 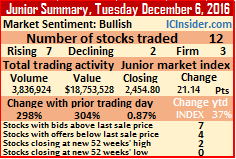 The movement in the junior market index puts the gain for the year to date, at 36 percent. Stocks traded, rose on Monday by 8 percent, from Friday’s level, ending with 965,067 units changing hands, valued at $4,640,109, up 62 percent from $2,867,579 on Friday. Market activities ended with 7 securities closing with bids higher than their last selling prices and just 3 ending with lower offers. An average of 74,236 units with an average value of $356,931 traded, compared to 74,215 units with an average value of $238,965 on the preceding day. The average for December to date is 125,269 units at an average of $538,279. 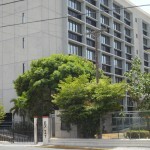 The average for December to Friday is 150,785 units at an average of $628,952. The average for November ended at 109,679 units with an average value of $607,092. The stock split into 150 stock units for Eppley ordinary share, is yet to attract any offers even after the bid had risen to $6.91 compared to the adjusted last traded price of $4.90. 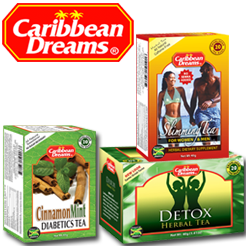 In trading activity, Caribbean Cream traded 69,747 units and rose by 40 cents to close at $7.50, Caribbean Flavours traded 1,630 units to end at $8.99 with a gain of 44 cents, Caribbean Producers fell 20 cents with 510,000 units changing hands to end at $3.30. Honey Bun had 105,000 shares changing hands to close with a loss of 13 cents at $5.70, Jamaican Teas traded 12,252 shares to close at $4.10, Jetcon Corporation traded with a loss of 10 cents, to close at $5.65, with moderate volume of 10,000 shares. Key Insurance traded 28,471 units to close at $2.50, Knutsford Express saw trading in 20,164 shares at $20, Lasco Distributors loss 20 cents after 145,442 shares changed hands at $6.60, Lasco Financial gained 5 cents and ended with 19,958 shares changing hands at $3.25. Lasco Manufacturing ended at $4.70 with a mere 770 shares changing hands Paramount Trading gained 10 cents while 5,979 shares traded, to close at $3.80 and tTech ended with 35,654 units changing hands at $5.50. 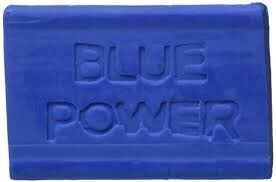 Blue Power leaves TOP 5. General Accident Insurance dropped in price during the week to be back in the junior market TOP 5 pushing Blue Power just out of the TOP 5, as demand pushed the latter up to $23 as the company reported strong increase in profit for the second quarter to October. Blue Power has sales for the quarter ended October 2016 increasing of $42 million or 14 percent to $339 million over the October 2015 period, while profit for quarter profit jumped 146 percent over the 2015 quarter to $32 million. For the half-year, profit more than doubled to $70 million from $32 million with earnings per share of $1.23 as revenues climbed just over 13 percent to $678 million. Jetcon Corporation that fell out of the top list in the week ending November 18 continues to climb away from the top list with gains during the past week. Barita Investments exited the TOP 5 during the week ending November 25 and has gone on the record further gains during the past week, as investors continue to react positively to the prospects for an outstanding 2017 based on the strong gains in net interest income and fee income for the stockbroker’s September quarter. These two stocks are up 64 percent and 77 percent respectively since they entered the Top 5 in September. Paramount Trading exited the TOP 5 and now has gains of 164 percent. Jetcon Corporation ended at a new closing high of $5.75 on Friday to gain 155% since listing. 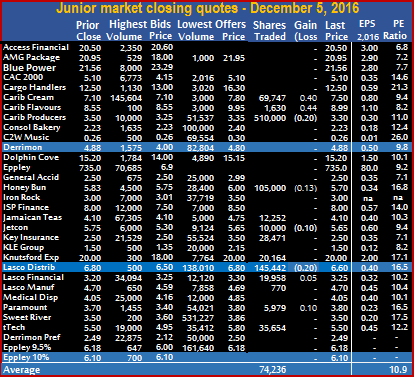 The junior market trading was dominated by trading in the shares of Lasco Financial, accounting for 84 percent of the total volume traded. In a moderate trading session the market index recovered 22.82 points to end at 2,423.87 on Friday. At the close the prices of 7 stocks rose and 2 declined with 12 securities trading, one less than on Thursday. 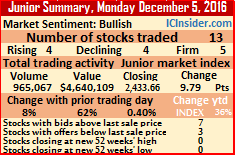 The movement in the junior market index left the gain for the year to date at 35 percent. Stocks traded fell on Friday by 70 percent from Thursday’s level and ending with 890,579 units changing hands, valued at $2,867,579, down 78 percent from $13,246,216 on Thursday. Market activities ended with 7 securities closing with bids higher than their last selling prices and just 2 ending with lower offers and one stock closed at a new all-time high. An average of 74,215 units with an average value of $$238,965 traded, compared to 227,356 units with an average value of $1,018,940 on the preceding day. The average for December to date is 150,785 units at an average of $628,952. The average for November is 109,679 units with an average value of $607,092. Eppley ordinary stock is yet to trade, after a split into 150 stock units for each one previously held. In trading activity, Caribbean Cream traded just 446 units at $7.10, Caribbean Producers gained 30 cents with 500 units changing hands to end at $3.50, C2W Music rose 1 cent with 4,500 units changing hands to end at 26 cents, Dolphin Cove traded 150 shares and rose by 5 cents to end at $15.20. General Accident shed 10 cents and closed trading with 23,908 units at $2.50, Honey Bun had 4,658 shares changing hands to close at $5.83, Jamaican Teas traded 9,009 shares to close at $4.10, Jetcon Corporation traded with a gain of 50 cents to close at a new high of $5.75 with moderate volume of 7,300 shares. Key Insurance lost 5 cents in trading 63,100 shares and ended at $2.50, Lasco Distributors rose 15 cents after 7,260 shares changed hands at $6.80, Lasco Financial gained 5 cents and ended with 752,444 shares changing hands at $3.20 and Lasco Manufacturing gained 15 cents to end at $4.70 with a mere 17,304 shares changing hands. Jetcon Corporation ended at a new closing high of $5.25 on Wednesday to gain 133% since listing. 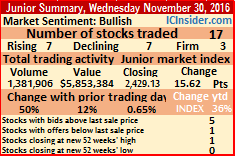 The junior market ended November on a positive note with the market index rising 15.62 points to end at 2,429.13 on Wednesday. At the close the prices of 7 stocks rose and 7 declined with 17 securities trading, the same number as on Tuesday. 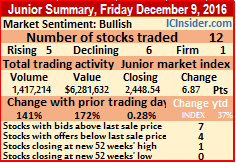 The movement in the junior market index lifted the gain for the year to date at 36 percent. The volume of stocks traded rose on Wednesday by 50 percent from Tuesday’s level and ending with 1,318,905 units changing hands, valued at $5,853,384, 12 percent from $5,225,495 on Tuesday. Market activities ended with 5 securities closing with bids higher than their last selling prices and just 1 ending with a lower offer. An average of 81,289 units with an average value of $344,317 traded, compared to 61,261 units with an average value of $348,366 on the preceding day. The average for the month to date is 109,679 units for an average of $607,092 compared to 111,031 units valued at $619,605 on Tuesday and 129,138 units with an average value of $709,705 for October. In trading activity, AMG Packaging rose $1 to close with 971 units changing hands at $18.50, CAC 2000 added 99 cents in trading 100 shares and to close at $5.10, Cargo Handlers ended with 59,932 units and regained 50 cents to close at $12.50, Caribbean Cream closed with 125,000 shares changing hands and lost 29 cents to end at $7.10. 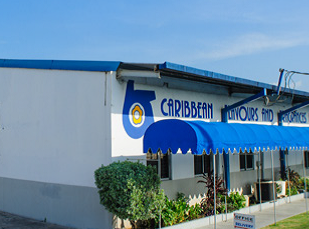 Caribbean Flavours fell 6 cents, in trading 5,500 units at $8.55, Caribbean Producers fell 25 cents in trading 65,801 units to end at $3.20, Consolidated Bakeries lost 7 cents in trading 9,902 shares to close at $2.23, General Accident fell 5 cents and closed trading with 74,300 units at $2.60. Honey Bun gained 51 cents with 11,654 shares changing hands to close at $6.01, Jetcon Corporation ended with 138,521 units changing hands, 23 cents higher at a 52 weeks’ closing high of $5.25, Key Insurance traded 15,000 shares and ended at $2.50. 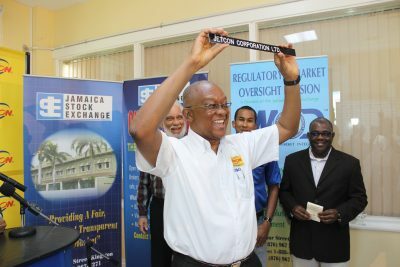 Lasco Distributors closed with 20,700 shares changing hands, at $6.80, Lasco Financial lost 10 cents and ended with 750,000 shares changing hands at $3.10. Lasco Manufacturing rose 14 cents to end at $4.69 with 12,211 shares changing hands, Medical Disposables lost 25 cents in trading 76,942, shares to close at $4.05, Paramount Trading gained 20 cents with 10,000 units changing hands to close at $3.70 and tTech ended with 5,372 shares changing hands at $5.50. 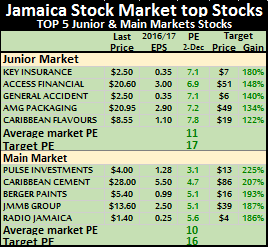 Stocks levels surged in early trading on the Jamaica Stock Exchange, resulting in the main market indices continuing to climb while junior market index moved up marginally in early Wednesday trading. 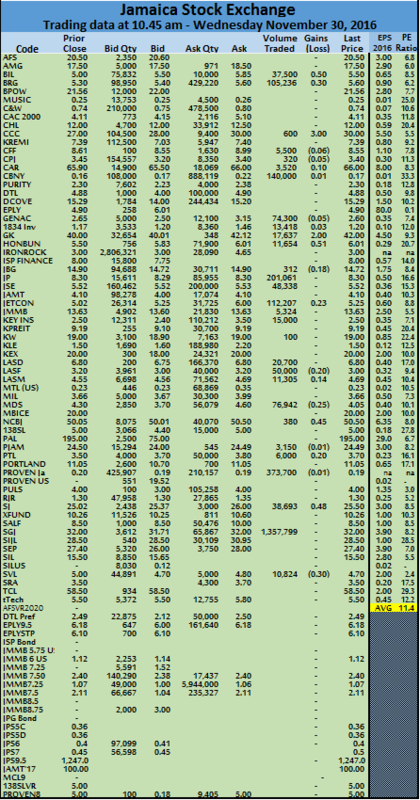 A total of 29 securities traded of which 13 advanced and 7 fell, resulting in a volume of 2,741,520 shares changing hands carrying a value of a $49,745,268 compared with just 158,064 shares changing hands with a value of $1,132,861 on Tuesday. The average number of shares traded, amount to 94,535 units versus 7,185 units on Tuesday. At 10:45 am the all Jamaica Composite Index jumped 924.41 points to 195,809.85 the Jamaica Stock Exchange Market Index climbed 826.59 points to 179,150.93, the Jamaica Stock Exchange combined index gained 971.88 points to close at 191,141.50 and the junior market index gained 19.98 points to end at 2,433.49. The main trades after more than an hour of the markets opening are Berger Paints with 105,236 units at $5.60, Ciboney with 140,000 shares at 17 cents, Jamaica Producers, 201,061 shares at $8.30, Jamaica Stock Exchange	48,338 units at $5.52, Scotia Group with 1,357,799 shares at $32, Proven Investments 373,700 shares at 18.55 US cents, Jetcon Corporation 112,207 shares at $5.25, Medical Disposables 76,942 units at $4.05.